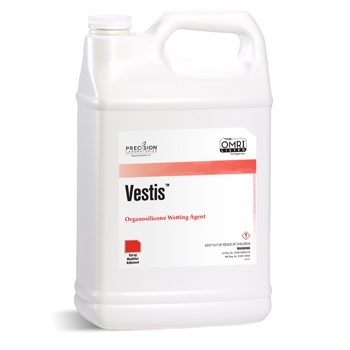 Vestis is a nonionic organosilicone wetting agent designed for use with; crop protection products, plant growth regulators, fertilizers, microbial products and plant nutritionals. Vestis lowers spray solution surface tension to improve wetting and uniformity of leaf surface coverage beyond that of ordinary surfactants. Vestis is ideal for use where coverage is critical. It is especially well suited for low water volume applications made by ground or aerial equipment where spray coverage may be a limiting factor. Ground: Use 3.2–13 ounces per 100 gallons of spray solution. Aerial: Use 12–19 ounces per 100 gallons of spray solution.